Julie and Kyle’s son Kolter sometimes goes by the name Houdini, which is a nickname he earned during his many hospital stays and because of his successful escapes from the crib, his IVs, his diaper, his braces and more. “He’s even escaped the house to explore the world two times,” Julie said. Kolter also loves popsicles and cats, especially his cat, whose name is Popsicle. Kolter was born with bi-lateral hearing loss, so he wears hearing aids daily and has cognitive and developmental delays. He had a g-button for more than half of his life, but they were recently able to remove it, and he had surgery to close the button site. And in 2015, he was diagnosed with muscular dystrophy. Kolter recently started Kindergarten and he loves it. “He is excelling well, and I look back and wonder why I ever questioned sending him to Kindergarten in the first place!” Julie said. Kolter is non-verbal, so all of his teachers sign to him, along with his classmates, and Kolter also has a para-educator. Kyle is a self-employed mechanic, and Kolter enjoys going to Dad's shop and helping him. “He really loves the car hoist,” Julie said. Kyle is also a fireman, and Julie has several part-time gigs that include filling in at a local gas station, working a local flower shop and working with the Niobrara Council. But, a majority of her time is spent working the ambulance as a volunteer EMT for 911 calls and doing transfers to higher-care facilities. Julie also finds time to advocate, raise awareness and fundraise for several things: the deaf/hard of hearing community, sign language and MDA, to name a few. 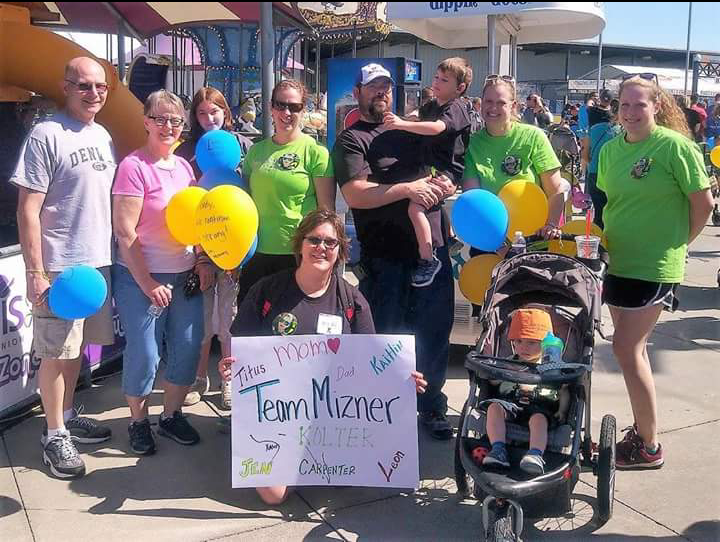 Julie loves to be a support to newly diagnosed families and can be reached at 402-322-1566 or via Facebook as Julie Sisson Mizner or Kolters Krew. She also blogs here.